At first glance, Mr Lengfei Tok and Mr Gareth Dean Lee look like your average, baby-faced young men. But they are not mere 23-year-olds. The two friends, who have known each other since their days in Singapore Polytechnic, are the creators of Banwagon Bags/Wares, a line of simple and chic leather accessories founded in December 2012. The idea for the brand first took shape while they were serving national service, Mr Tok explains. "When we were posted to the same camp during national service, I asked Gareth for his advice on bag sketches I had made," he says of Mr Lee, who had previously dabbled in making fabric bags and pouches for fun. "I always thought there was a functional appeal in bags." The two craftsmen - whose appreciation for good design is apparent in their simple but interesting ensembles worn during the interview - then decided on a clean, classic style, free of frills or embellishment. "Other leather brands tend to be more 'biker', with heavy looking designs, thick leather and chains," says Mr Lee. "We wanted something really simple and functional." Self-taught through books and videos, the duo, who have diplomas in visual communications, also came to the conclusion that the brand name should reflect a consumer thoughtfulness that they believed was lacking in today's market. Says Mr Tok: "People should know where brands come from and what exactly it is they're buying. We essentially wanted to stop the 'bandwagon effect' of people buying things just because other people were." Prices range from $30 for a key fob to $565 for a bag. About 20 pieces are sold on average each month. The brand's handmade goods take anywhere from a few days to a few weeks per piece to construct in their home-based workshops (Mr Lee lives in Jurong West and Mr Tok in Choa Chu Kang). They are made from leather sourced from American tanneries Horween Leather Company and Wickett & Craig, which supply material to brands such as American footwear label Wolverine and accessories brand Filson. This is so that they can assure customers of the leather quality in addition to the craftsmanship, they say. Perhaps the biggest stamp of approval Banwagon Bags/Wares has received during its journey so far would be from its stockists, which now include uber-chic multi-label boutiques Front Row and Maison Ikkoku. "We were definitely happy to see our stuff at places like Front Row," says Mr Lee. "It made us feel like we were doing something right." Other brands carried at Front Row include French label Christophe Lemaire and Flynow from Thailand. That being said, the duo admitted they did not have an easy start. In addition to making mistakes, such as miscalculating leather sizes for a tote and wasting material, which they both described as "expensive lessons", their first public outing was a disaster. "We first signed up to showcase our wares at a Handmade Movement Singapore event in January last year at Fort Canning Park, but when we got there we were shocked to be alongside home-made baby clothes and knick knacks," says Mr Tok, with a wry smile, of the discrepancy between their expectations and reality. Adds Mr Lee: "There was a price mismatch too - we were selling items for $200 while others at the event were selling stuff for $20. Plus it started to rain and we had to protect the more than 50 items we had brought." Despite not selling anything that day, Mr Lee says it was a good learning experience. "We really started to question ourselves and what we were doing but we got feedback from the people there that our stuff was good, just probably in the wrong setting." Mr Tok and Mr Lee both say that getting day jobs to support themselves financially is a probable necessity as the brand has yet to break even. But they intend to keep the brand to themselves rather than take on investors, so that they can execute their uncompromising vision and retain creative control. "We don't want to be liable to anyone but ourselves," says Mr Tok. Mr Lee chimes in, adding: "We're easy-going when it comes to life and each other, but not when it comes to design." Most artisans would have had years of experience working with their chosen craft, or grown up making things as a hobby before starting their own business. Not Mr Jacob Chee, 28, and Mr Jeremiah Ng, 29. Their knowledge and interest in leathercraft started only a few months before they launched their own brand jConcetto in December 2012. Mr Chee picked up the craft thinking that it would be easy to make a wallet for a friend's birthday. "I thought I could use needle and thread from my mother's sewing kit to sew pieces of leather together. It was a disaster, the seams wouldn't hold up," says Mr Chee. Undeterred by the failure, the former project manager in a bank spent all his free time reading online tutorials and books about leathercraft. Eventually, he managed to give his friend not just a wallet, but a namecard holder as well. Meanwhile, Mr Ng was also picking up leathercraft through books to make a namecard holder for his wife when a mutual friend introduced him to Mr Chee. Within a month of getting acquainted, the duo decided to set up a company together, selling their leather wallets, namecard holders, keychains and other small leather accessories. "Close friends found out that we were learning to make leather goods and started asking us to make them something, so we thought it would be a good business to start," says Mr Chee, who left his job this month to concentrate on running the online business. "I wouldn't say that we're experts, we're still perfecting our craft," adds Mr Chee. But business has been going well, despite their relative inexperience. The company broke even within six months of operation. Its vegetable-tanned leather products range in price from $12 for a keychain to $499 for a wallet. Products are made out of leather from tanneries in Japan and Italy, as well as linen thread from France. They currently sell about five products a week through their website and online multi-label store Naiise. But they hope that sales for customised orders will increase now that Mr Chee is working full-time on the brand. To facilitate their work, Mr Ng and his family will be moving out of his home in Balestier into a Queenstown flat which is next to Mr Chee's home by the end of this year. They currently make their own products out of their own homes. For some, their leather products may seem too simple in design, but the makers say that was their intention. Aside from a basic hand stitch and the brand's tree logo embossed on each item, its products are free from any other design details. "We wanted to keep our products classic. We won't call ourselves fashionable, so we wanted something that less fashion-forward men would not be afraid to carry and stylish men would want as well," says Mr Ng, whose day job involves designing software for the Singapore Real Estate Exchange. Although their brand name resembles another more established local leather brand - The J.Myers Company founded by Jeremiah Ang - the founders of jConcetto say that the similarities are purely coincidental. Concetto means concept in Italian and the letter J was to take into account both their first names. 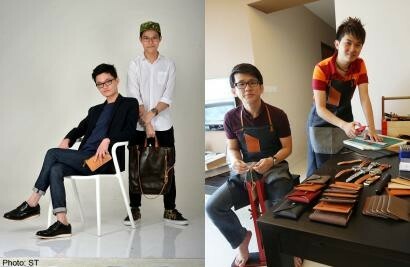 Since last month, the duo also started conducting leathercraft workshops. Mr Chee says that after a year of running the business, they are proficient enough to teach others how to work with leather. But when it comes to mixing leather with other fabrics, Mr Chee says that they have yet to master that themselves. A basic leathercraft workshop costs $80 per person and provides an introduction to the different types of leather, as well as cutting and burnishing techniques. A separate workshop on stitching costs $89. Participants of both courses will get to make a small leather item to take home. "The satisfaction of making something you can call your own is quite immense, which is why I've turned it into a career. We wanted to share that feeling with others," says Mr Chee.